Lisa is a voice teacher, choral conductor and professional mezzo-soprano. Originally from Alberta, Lisa completed a Bachelor of Music/Bachelor of Education degree from the University of Lethbridge, specializing in elementary, intermediate and senior choral music. She moved to Ottawa where she received a Master of Music in Vocal Performance at the University of Ottawa. As a soloist, Lisa frequently sings with choirs and orchestras throughout Alberta, Ontario and Quebec. 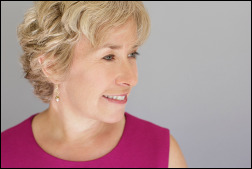 Lisa has been involved with Opera Lyra chorus, Cantata Singers of Ottawa, Seventeen Voyces, the Vancouver Chamber Choir National Director's Symposium, and the Valley Festival concert series. She regularly performs with her Ottawa-based vocal ensemble “Tria”, and has appeared in numerous concert series including the Ottawa Musical Arts Club Gala Evening and the CBC National Gallery lunch hour series. Lisa has a very active vocal studio in Arnprior, Ontario where she teaches both school-aged and mature students. She creates an enjoyable, fun and positive learning environment for all students. She is extremely proud and inspired by many of her former students using their voices in Canada and other countries in a variety of ways. Devoted and committed to promoting the Arts in Arnprior, she is the founder of the Arnprior Summer Music Camps, the Arnprior Community Choir, Two Rivers Musical Productions, the Ottawa Valley Girls Choir, and an exciting ladies ensemble "Tutti". These programs are a mainstay in the cultural arts scene and have provided many singers with the opportunity to experience exceptional solo and choral music. ﻿A teacher, music leader and accompanist, Andrea lives a life full of music. She has a dynamic music studio with students participating in festivals and exams as well as playing within their community. Andrea's first lessons were in the Music for Young Children program at the age of 4, a program she now teaches. She credits her early teachers with inspiring and shaping her musical journey. Andrea strives to make music relevant and fun for her students. Now a student herself, Andrea is studying web development at Algonquin College. Andrea has also been the organist for Central Lanark Pastoral Charge since 2003 and accompanist for the Arnprior Community Choir since 2009. As well, she served as vice president and secretary on the Board of Directors for Almonte in Concert. Andrea completed her Grade 10 Piano with the Royal Conservatory of Music. She has also studied Piano Performance, Music History and Piano Pedagogy with Dr. Marie-Hélène Crawford and Paulette Price; Harmony, Counterpoint and Analysis with Dr. Maya Badian; Pipe Organ with Robert Jones; and Voice with Lisa Webber.